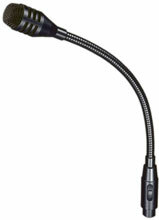 The Bogen GDU150 Gooseneck Microphone has been discontinued. No direct replacement is available. Bogen's dynamic gooseneck microphone, GDU150 Gooseneck Microphone, features outstanding speech intelligibility, feedback rejection, user sound isolation, sound pressure capability and low sensitivity to breath/pop noise. The GDU150 Gooseneck Microphone boasts advanced features such as cardioid pickup pattern, dynamic condenser element, 250-ohm impedance, wide frequency response range of 100Hz - 12kHz, & a low sensitivity of -75 dB +/- 3 dB. Its elegant design offers smooth, noiseless and precise microphone positioning. It also features a superior shock-mount system to reject handling and transmission noise, a built-in locking push- button on/off switch, and a multi-layer breath/wind filter.